This book is like a class on creativity. What is it, the habits of people who have it. What you can do to get it, increase it, evolve it. As with any class I’ve ever taken there were some very interesting parts and some parts that I completely tuned out. I like to think there were more of the former but don’t ask me for specific examples. 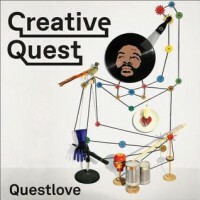 A lot of Questlove’s learning and teachings on the subject obviously were learned from someone who creates music, however, he does explore in to the creativity of writers, chefs and even comedians. I think this book would be beneficial for anyone who is in a creative field but also anyone who is trying to figure out how they can think differently about any subject. This is one of those books that I think you read, you try to apply it to life then you read again to see how well you interpreted it and if you need to adjust. Or maybe you will get a completely new lesson in the reread.